In this surreal image, two vintage telephone receivers--red and yellow--grow out of a field of grass, intertwined with and facing one another. 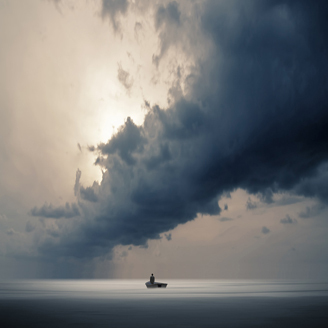 The vintage, faded colors, along with black and white and serene nature, reflect the signature style of contemporary photographer Philip McKay. 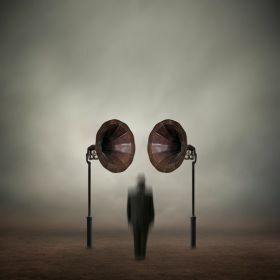 This surreal image depicts the blurred figure of a man in a suit and hat, standing between two giant antique phonograph speakers. 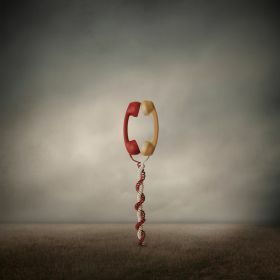 The spare, vintage color scheme and serene nature reflects the signature style of contemporary photographer Philip McKay. 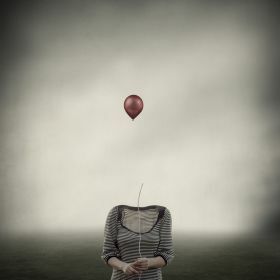 In this surreal landscape, the shape of a nearly invisible woman with only her shirt, forearms and hands showing, stands in a grassy field, holding the string to a red balloon, which has broken of and flown away. 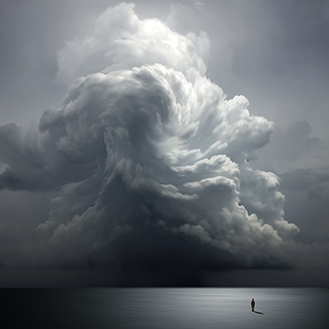 The faded, vintage color scheme (in addition to black and white) and serene nature reflect the signature style of contemporary photographer Philip McKay. 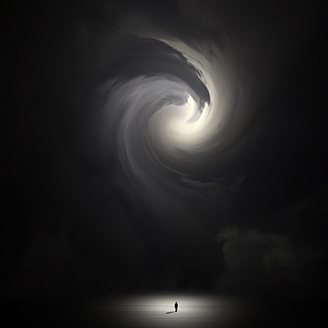 This digital art was created in photoshop cs6 extended. 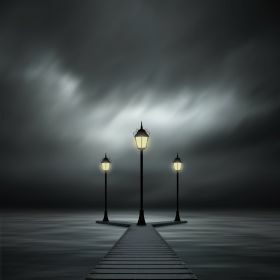 In this surreal image, a dock rises just over the water line and contains 3 looming lanterns at its end. The water is surprisingly calm considering the stormy sky above. The yellow light of the lanterns gives color to an otherwise gray landscape. 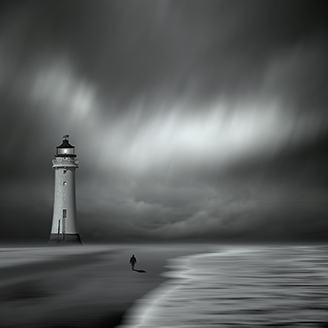 The black and white color scheme and serene nature reflects the signature style of contemporary photographer Philip McKay. 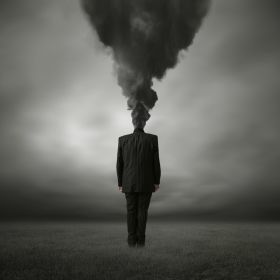 This surreal image depicts a person in a business suit, standing in a grassy field and facing away from the viewer.Thick, black smoke rises from the collar in place of a head. Only the person's hands are shown in color. 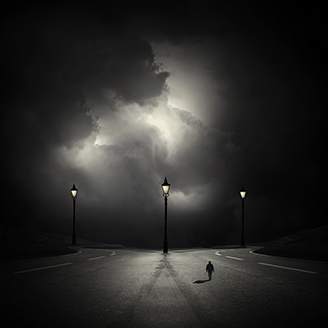 The black and white color scheme and serene nature reflects the signature style of contemporary photographer Philip McKay. 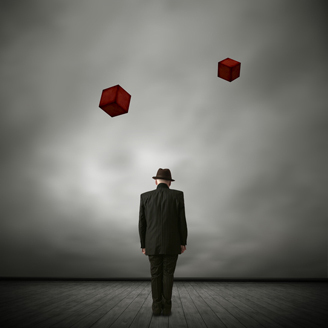 Exorcising Ghosts by Philip McKay features a man standing perfectly centered as two red cubes hover in the air like forgotten thoughts. 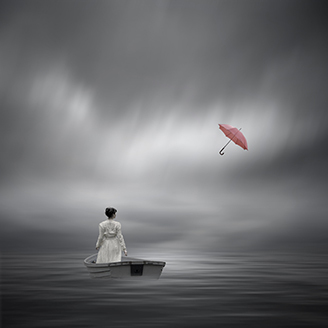 Perfectly marrying photography and digital artistry, this affordable fine art poster captures the surreal nature of the majority of Philip McKay's work. 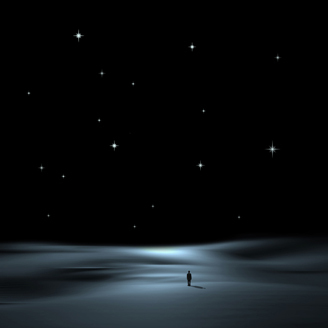 Follow the Stars by Philip McKay depicts a soft blue gray landscape with twinkling star shine piercing the pure black sky. 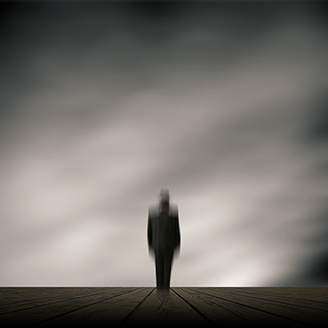 A figure, accompanied only by his shadow, stares into the darkness. 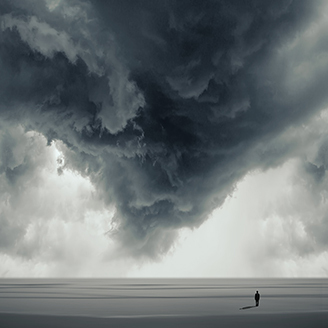 The clarity and sharpness of the sky is perfectly juxtaposed with the dreamlike landscape. This original art print is a testament to surrealism. 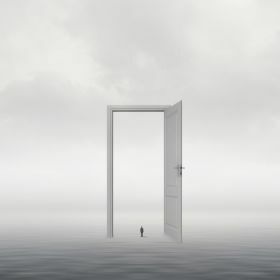 The tiny figure of a person stands in a giant open doorway, atop still waters. 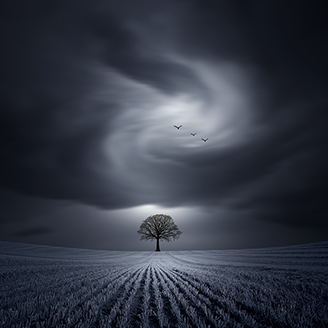 The black and white color scheme and serene nature reflects the signature style of contemporary photographer Philip McKay. 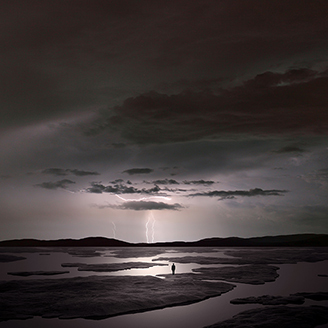 In this surreal landscape, a person stands atop a frozen body of water. 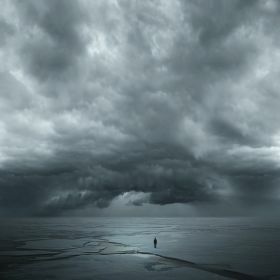 Dark clouds loom in the distance. 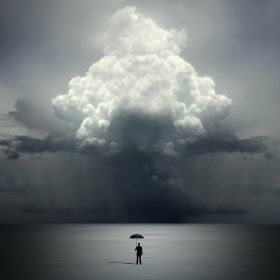 The black and white color scheme and serene nature reflects the signature style of contemporary photographer Philip McKay.